Hm. I shall have to revise the TGIQ Ant Classification System™. These are neither black NOR red NOR winged. They are decidedly Orange. But they are Little. And Non-stingy. And very much perturbed by the audacity of my rock-lifting activities. The larger workers seemed to be in charge of moving the curled white larvae to safer below-ground chambers. 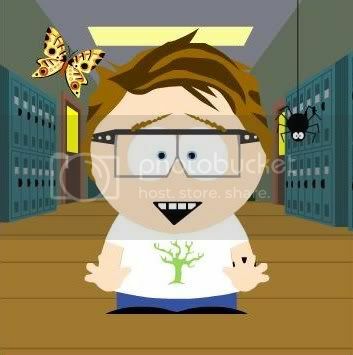 I’m going throw myself to the wolves (ant guys, be nice!) 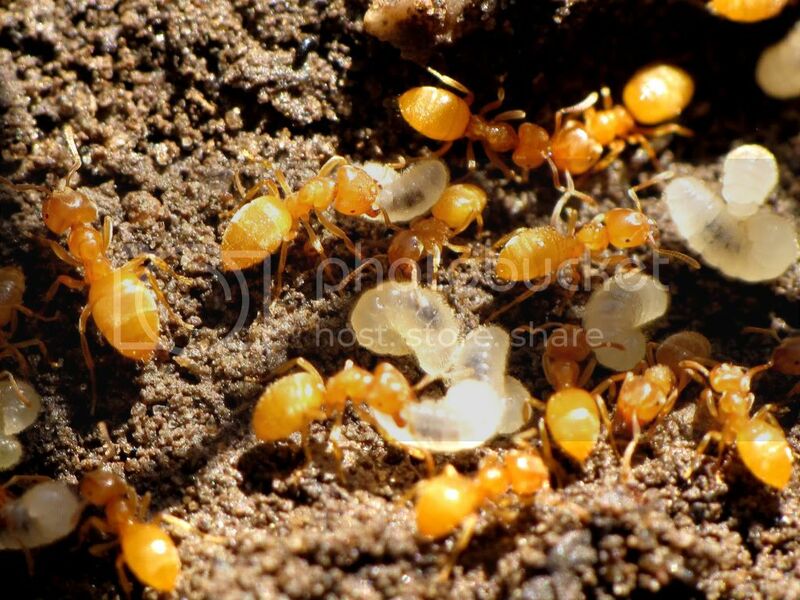 and guess that these Little-Orange-Non-stingy ants might perhaps possibly be Lasius sp. …a Citronella Ant? I did not notice whether they had a smell; I was too busy holding my breath so as to avoid camera shake. 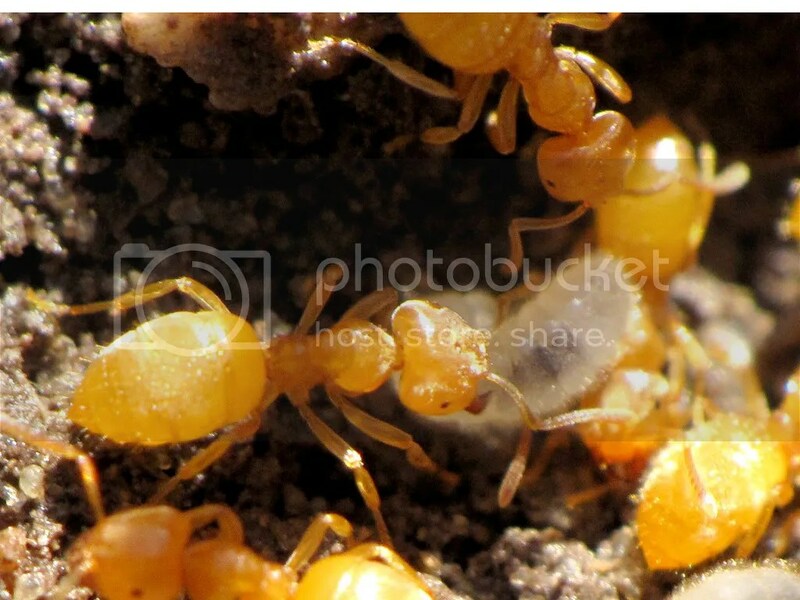 These workers have clubbed antennae, a very distinct yellow-orange colour, very tiny compound eyes and no ocelli – they’re virtually blind – a nod to their subterranean habits. So? What do y’all think? Looks like Lasius umbratus to me. I posted some pictures of this species in September. Of course, I didn’t check its range or open any of my ant ID books before leaving this message. I took a day off work to spend some time outside and am catching up on reading blogs while I eat lunch. Well, food’s gone, gotta go. Hm. Can’t find anything specifically for Ontario, but it IS in New England (seems widespread in the northeast), so it’s completely conceivable that we’d have it here too…let me know what those ant ID books say, OK? I don’t know – a true pismire quagmire! You know, C. I gave up my PNS long ago and never invested in a macro lens for my dSLR, but by golly your photographs really demonstrate that I have much to learn. Thank you! Hey, are you calling my photos smelly??? ?